While the Philippines has a strong legal claim to the China-controlled Panatag-Scarborough Shoal, it is “illegally occupying” two other small islands in the Kalayaan-Spratly Island group claimed by Vietnam, an American research firm claims. Researchers from Virginia-based think tank CNA argued that the Philippines cannot lawfully classify the whole Kalayaan group of islands under its sovereignty. At least two of the maritime features under Kalayaan-Thitu (Pagasa) Island and Loaita-Kota Island – also claimed by Vietnam devolve from a legal annexation document issued by the French colony in 1933. “The legal annexation by France was, at the time, a lawful method of territorial acquisition and its rights devolved to Vietnam,” the research stated. The annexation was backed by France’s maritime activities prior to World War II as well as evidence that the claims were not abandoned after the war. “The Philippines is illegally occupying two small islands in the Kalayaan Island Group that are the rightful property of Vietnam,” the paper’s legal conclusions noted. It is also possible that Northeast Cay (Panata Island) should be included in the list of unlawful Philippine occupations, “but more evidence is needed,” said the group. The research firm, funded in part by Washington, released the study last month to aid the United States policy in the disputed South China Sea. It also assesses legal merits of overlapping claims of Vietnam, China, the Philippines, Malaysia and Brunei. 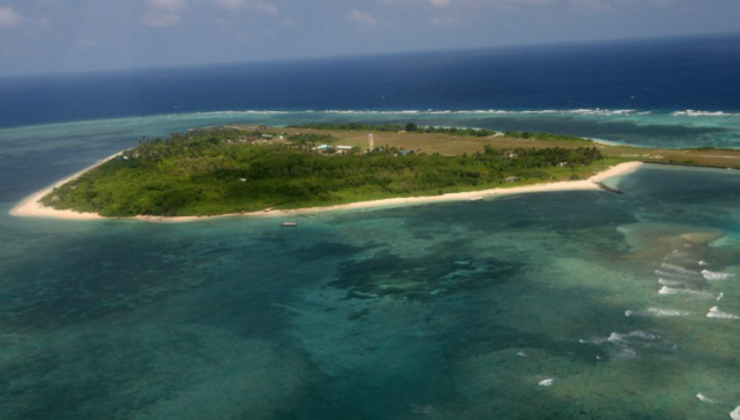 “The ubiquitous Kalayaan Island Group claim by the Philippines carries little legal weight. It stands on the same footing as the nine-dashed-line claim of China. Also, it was made later than the claims of China, Taiwan and Vietnam,” the paper noted. The Philippines, however, has maintained that Pagasa and Kota Islands were terra nullius or “land belonging to no one” when it stationed soldiers there as well as six other features from 1968 to 1971. The Kalayaan claim was formally asserted by President Ferdinand Marcos in 1978 through Presidential Decree 1596, naming the Kalayaan Islands as part of the province of Palawan. Pagasa, the second largest in the group after Taiwan-occupied Itu Aba, has a Filipino population of about 200 and has several structures including a municipal hall, health center and an air strip. Kota, meanwhile, has some shelters serving token presence of soldiers. The paper admits that while the Philippines’ administration of the islands can be legally contested, the application of Vietnam’s territorial claims will face practical challenges. “The political realities of uprooting Philippine citizens from these areas, especially Pagasa, may be something different entirely,” the study noted. The study, meanwhile, credits the Philippines for having superior claims based on “effective occupations” and “first discovery” of four high-tide features in Kalayaan, namely, West York (Likas) Island, Nanshan (Lawak) Island, Flat (Patag) Island and Lankiam (Parola) Cay. “Title in these four islands should vest to the Philippines,” it said. The country’s arbitration case sought against China asserts only maritime jurisdiction in the West Philippine Sea based on the 200-nautical mile exclusive economic zone and continental shelf, and not sovereignty claims over occupied territories. The authors noted that if opposing territorial claims over the South China Sea will be ruled by a court, it is unlikely that it would award a single country title to all of the disputed features in the Spratlys. “Determining whose claim is superior is not a cut-and-dried process,” the study said, quoting national security lawyer and retired Navy Capt. Mark Rose.